When I first read about Dash, I did think it was an April Fool’s joke. Lord knows I resent having to remember to replenish the boring stuff I need – detergent, paper towel, Brita filters. That said, as an Amazon Prime customer (which already has my hackles up as I think it is pointing me to a more expensive option), why on earth do we need buttons around the house. In a world where we spend way too many hours online, can’t Amazon come up with a refill service that guarantees you fast delivery at a consistently low price? I don’t care if it is the cheapest price though if you read Brad Tuttle’s Why People Aren’t Using Their Amazon Dash Buttons to Buy Stuff, you find out that the button doesn’t tell you the price and the price can fluctuate wildly. The “net-net” is that the price and delivery time don’t compare to Prime – and it is Prime customers who are most likely to buy a button for $4.99 and then often not redeem it with their first purchase. If companies are going to enter our homes with stuff, it has to make life easier and better so we spend more time on what we love to do and share that love with the company who made it possible. I know Amazon likes to experiment (I’m still waiting for the drone I saw on 60 Minutes to land in my lobby.) However, there needs to be some forethought about customers. Humans may be emotional and irrational in our brand choices though we’re not stupid and it feels “unloving” to be duped by a button. 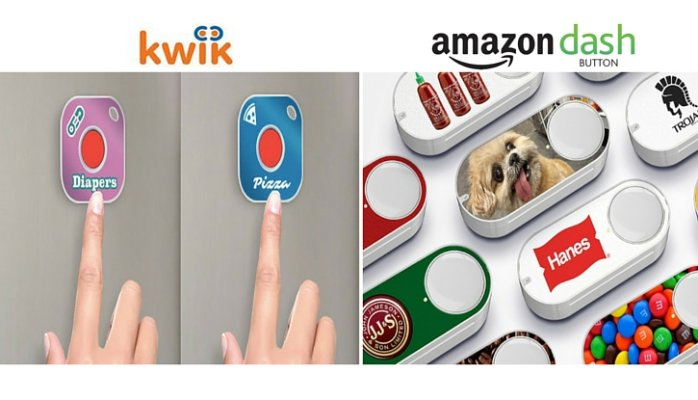 If Dash is going to get traction for those who want buttons around their house, the premise has to be that pricing and delivery is on par with Prime. Interesting to look at another button model, Kwik, which is free. Huggies, Domino’s and Budweiser (three definite high replenishment brands) use it to sell direct, http://tcrn.ch/28Myu4G.